Paris attraction-guides.com - Paris, France attractions guide featuring Paris, Ile-de-France Ch‰teau de Versailles (Palace of Versailles) information, including location, contact details, opening hours, admission and general Paris, Ile-de-France, France FR Ch‰teau de Versailles (Palace of Versailles) information. - Last updated 30/10/2012. 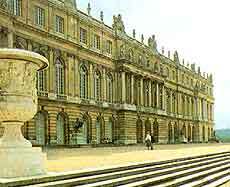 Château de Versailles (Palace of Versailles) is one of the grandest palaces in the world. This spectacular palace was built for King Louis XIV (the Sun King), the Palace of Versailles is one of France's most visited attractions. The stunning palace bears testimony to the grandeur of classic French architecture and is surrounded by magnificently landscaped gardens. There are two smaller chateaux in the grounds of the palace - Grand Trianon and the Petit Trianon, which was once the residence of Marie Antoinette. The most fascinating features of the palace include the State Apartments, and the Queen's Apartments, whilst the most famous room is the breathtaking Hall of Mirrors, which measures 71.0 metres / 236 feet long and links the north and south apartments.